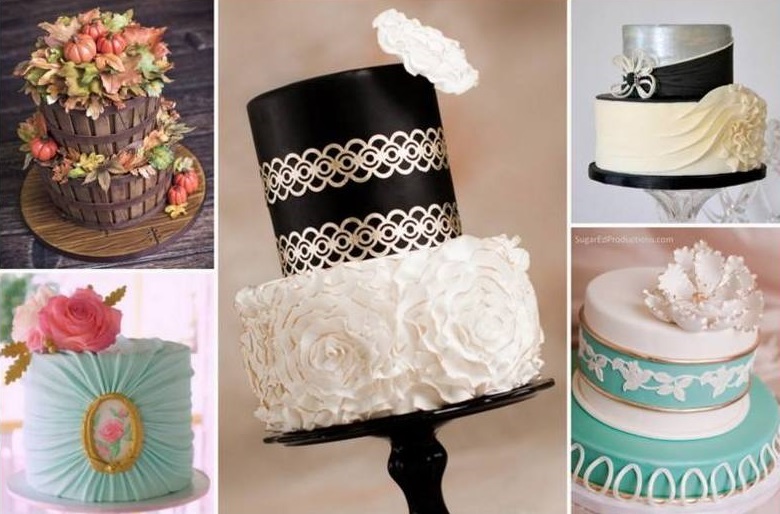 Tutorials, techniques and tips shared by bakers and cake decorators, both professional and hobbyists, with a passion for the sugar arts. When you click on a page, scroll past this week's featured photo to view. 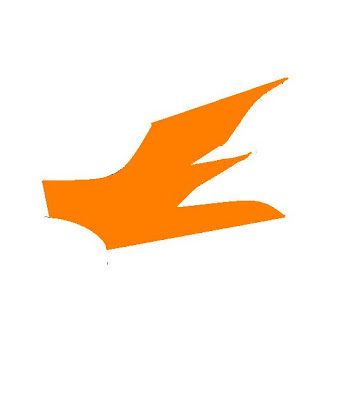 This site is dedicated to sharing what we have learned with you! Enjoy our tutorials, and if you have a question please feel free to ask! I know one of our sugar enthusiasts will either know or try to find the answer. We all have something to share...and we all have something to learn! Click on photo for Jennifer Dontz's tutorial for making Sugar Glass Butterflies! This recipe was the first one I ever received or made. It dates back to 1965. I'm not sure who the originator is, but these are still the best. Mix flour with baking soda. Bake at 375°F for 8 – 10 minutes…9 minutes works best for my oven. This material may not be republished or reproduced in any manner without the expressed permission of the author. This week's tutorial is on frill cutters. Step 1: (Sorry about the not so clear picture above). I roll my paste through the pasta roller. If you don't have a pasta roller, I highly recommend getting one. They make sugar art so much easier. I especially love the attachment that goes on my Kitchen Aid mixer. I love using the multi-ribbon cutter when I use these cutters. This little wonder will adjust easily to make a number of different width bands. Then you have a quick, straight line to work from when placing your cutters. 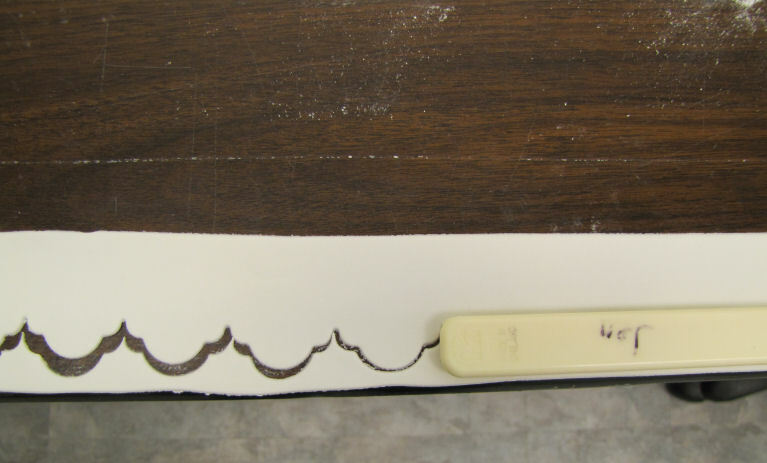 Roll the tool along your paste to make the desired band width. 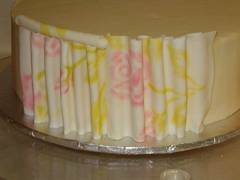 I also use this tool to make all my side ribbons for cakes, works great! 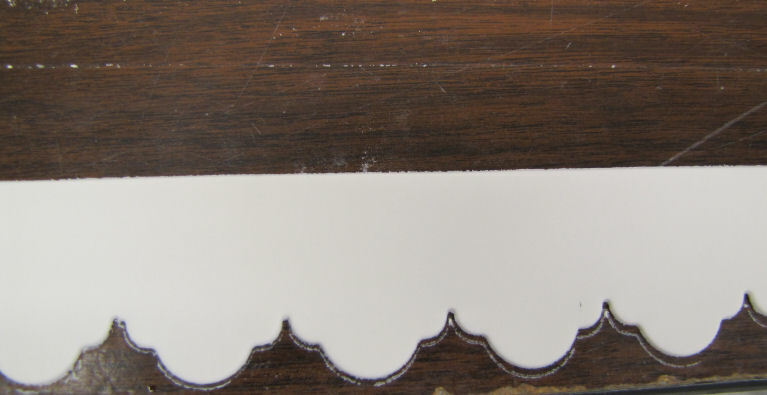 Step 2: Take your frill cutter and match a straight edge of it against the straight edge of your paste. Be sure to dust the bottom of the paste and I usually lightly dust the top as well. Just go along the whole length of the paste, after cutting one of the cutters, just match up the end and continue going down the paste. Now you can either disgard the bottom part or choose to use it to layer one design on top of the other. Step 3: Paste is all cut. Now you can apply to your cake like this, or if you choose, you can make some little cutouts in it. You can get so many different looks to these simply by applying them in layers and using different things to make cutouts. See below the drastic difference in the same piece when you make some cutouts in it. Step 4: I used some round tips to cutout holes and the PME eyelet cutters worked great for the pretty little teardrop shape. 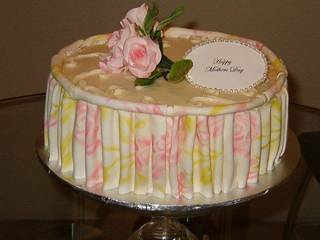 Here's a pretty spring cake I applied those frill cutter strips to. The birds are hand modeled and the pansies are piped. 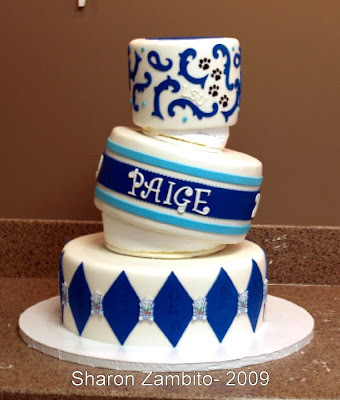 They really are easy to pipe and so pretty on a cake. Aren't these little mini cakes pretty? All done with frill cutters. We carry three sets on our site....here are some links to them. They run $7.00 per set. 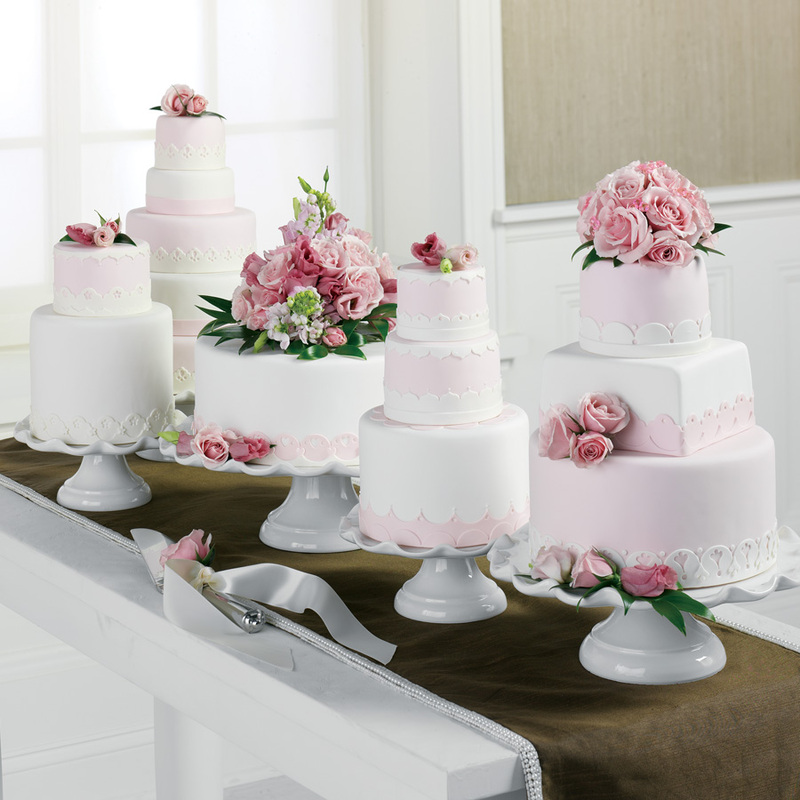 The above cakes were created by me for the BloomNet Floral book. It was such an honor to be a part of that! This material may not be reproduced without permission from the author. Here is a quick Step by step on doing the stencilled rolled fondant. I actually used a mixture of fondant and gumpaste, abut 70% fondant, to 30% gumpaste. Knead the 2 pastes together until smooth and pliable. I rolled by hand, but you could use a Pasta machine as well. 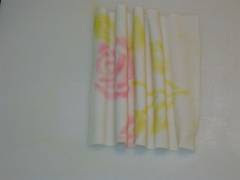 Roll medium thin, a bit thicker than for roses. Cut paste into the size you want to work with, I made panels about 4 1/8" tall by 7" long, fold back a tiny hem on the left and right sides of the panel. Measure the height of your cake for accuracy, mine was 4" tall. 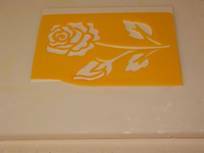 Lay your stencil on top and position where you want the flowers to go, taking into consideration that the top pleats will be covered slightly by hollow gumpaste tubes on the top of cake. I used soft bristle artist brushes for the stenciling, colored dusting powders in Pink and Apple Green. Try and keep the top of the paste covered with saran wrap as you are stencilling one flower, then move the saran as you go along to keep the paste from drying out before you are ready to pleat it. 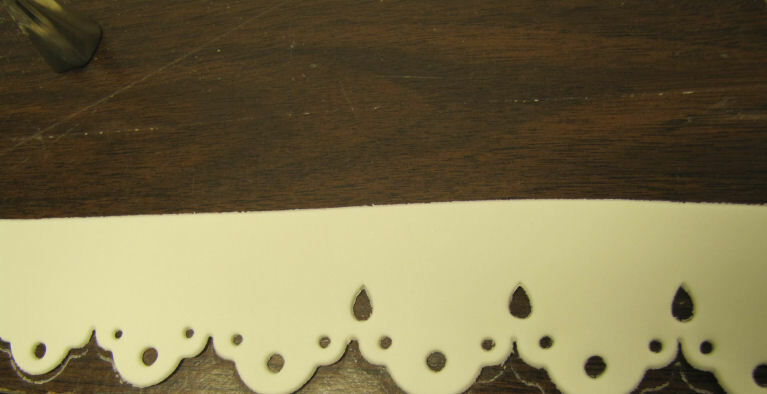 After you have brushed color on all the cutout areas of the stencil, lift the stencil carefully off the paste. I used Wiltons Doweling to make the pleats. You will arrange them alternately one on top of the paste, the next on the underside of the paste, begin from the left and continue until you have reached the right side. I positioned them about 1/2" or so apart. When you have lined up all of the doweling to fit the piece of paste, carefully begin to move the dowels in to pinch the paste into pleats or gathers, by holding the doweling from the top and bottom with both hands on the outside pieces, begin to move the doweling in from both sides of the piece towards the center until they form the pleats. Carefully lift off the top dowels, and slide the bottom dowels out from the bottom. 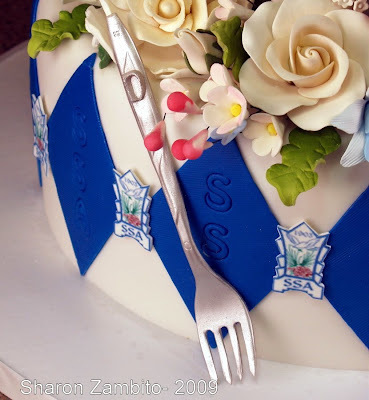 Lift the piece carefully with both hands at the top sides, attach to the iced cake. Each time you add a new panel, overlap slightly so the pleats will be even. Adjust as needed to straighten the piece. 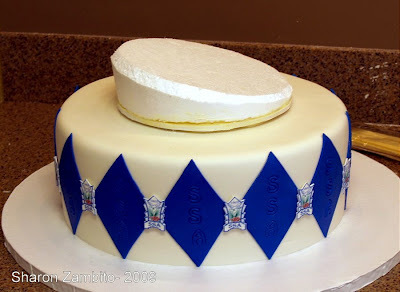 I only pressed the fresh paste against the side of the cake, the buttercream holds so you won't need to add gum glue. When all of the panels are in place you will then make the hollow tubes for the top. 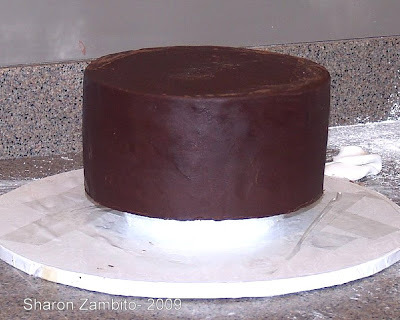 If you have measured the panel too tall as in photo #7 and it stands up too high on the top edge of the cake you will have to trim evenly with a pair of scissors. The hollow tubes are just a narrow piece of rolled, stenciled paste. Roll out paste, measure to about 1" tall by 3" long. 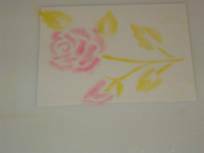 Stencil with color and lay the finished piece on top of a dowel stick, carefully form it around to make a hollow tube, slide the dowel out. Bend the tube gently to give it a slight curve. Brush the underside with a bit of gum glue and attach to the top of the pleated panel. 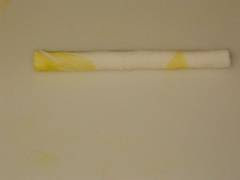 Leave a small space between the first tube and the next, roll a small piece of paste into a pearl shape, attach to each end of the tube with a bit of gum glue, then add the next tube, pearl, etc. until the top is covered. It took approximately 7 pleated panels to go around this 10" cake. 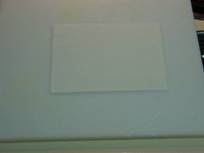 It will depend on how loose or tight you make the pleats, and how long you cut your flat panels of paste. It is easier to work with panels about 7" long, longer than that and they will be difficult to lift and place on the sides of the cake without tearing. Lay stencil on top and brush cut areas with powdered dusting color. Carefully lift the stencil off paste. Position dowels on top, then bottom of paste, alternate to end of panel. Space about 1/2" apart. 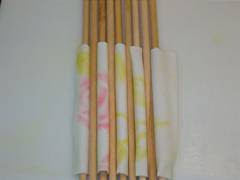 Move dowels towards each other from each side of panel to pinch into pleats. 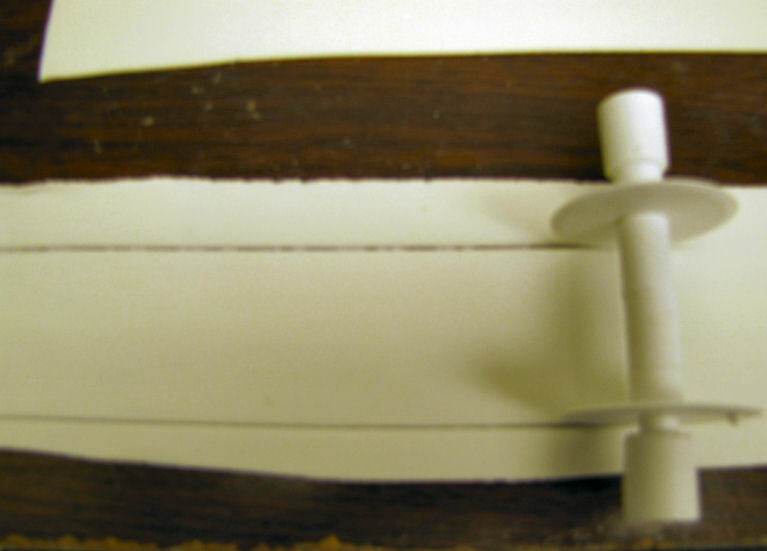 Pleated panel of paste. Lift carefully and attach to sides of iced cake. Each panel overlaps the previous one slightly. 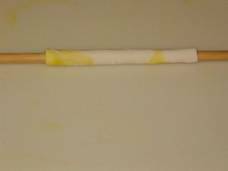 Hollow paste tube on dowel stick. Carefully slide the dowel out, leaving a hollow tube. Brush a bit of gum glue on underside, curve slightly and attach to top of pleated panel. Leave a slight space between each tube, make a small ball of paste in the shape of a pearl, and attach one between each tube. Finished cake with gumpaste roses. Photography and Tutorial by Shirley Wilson-Copyright -2004 All Rights Reserved. copied without the expressed permission of the author. Good gravy have I been busy! Running pillar to post. Burning the candle at both ends. Nose to the grindstone. Running around like a chicken with my head cut off. Burning the midnight oil. OK, I will stop. You get the idea. I bet you guys have been busy too since it is graduation time. 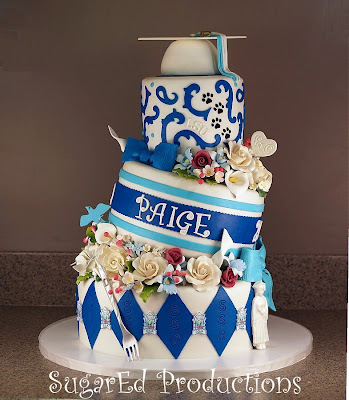 My beautiful and sweet niece graduated from high school last weekend, and I made her a special cake. I wanted to try the tilted method using wedges. I had not done that before. It was really pretty easy. I wanted to of course use her school colors and mascot, but also incorporate little bits of her life, while making it fun and whimsical. The grad hat was a styro ball I cut and carved a bit and covered with fondant. The mortar board was a square of fondant with tylose, dried ahead and glued on with chocolate. I used a 4 inch ball and a 5 inch square in this case. The clay gun was used to make the tassel. The scroll work was done with a cutter set available here. 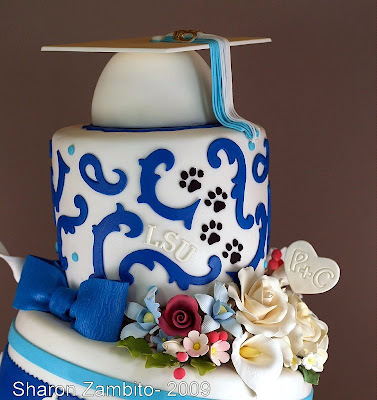 The paw prints were stenciled on, and represent LSU, where she is going to college. I used the alphabet tappit cutters for the LSU letters. I used the funky alphabet cutters for her name. The initials in the heart are of Paige and her boyfriend, Chris. I did not have time to make the flowers, so I purchased them, and dusted some to add color. The graduation figure was made with a chocolate mold. 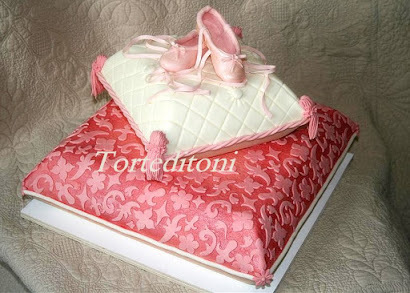 I used fondant with tylose in the mold, let it dry firm, and then airbrushed it with super pearl luster dust. I rolled out a piece of gumpaste and pressed it between 2 plastic forks that were stacked on top of each other. I squeezed them hard together to make the impression of the handle and the 4 tines into the gumpaste. While they were sandwiched together I trimmed around the outside of the fork edges with an exacto knife. Then I took the top fork off and let the cut out gumpaste sit atop the bottom one for a good long time. After it dried a good bit, I took that gumpaste "fork" and laid it on the table and trimmed to the exact outline of the impressions made by real forks. The handle was easy peasy, but trying to cut the tines out made me curse and throw things. And curse some more. They kept breaking off or were just crappy looking. After creating a graveyard of about 12 reject forks, I decided to go with shorter than real-life tines, and got one fork that was decent. I put that back on top of the plastic fork to get the proper shape and let it dry a day or two. Airbrushed it silver after I added the letter D on the top of the handle. I just knew I was going to break it, but God was smiling on me and it made it to the cake. Whew! Here are some photos of the construction. Please forgive the terrible quality of these photos. I was very pressed for time as my power had gone out for quite a while and put me behind schedule. On top of that, I was working with a heavily bandaged finger after slicing it it open cutting the Styrofoam wedges with a very long, very sharp knife. I think I needed a stitch or two, but no time for that! 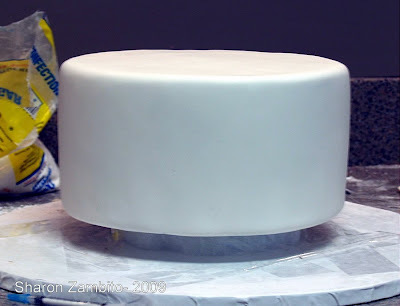 I put the ganached tiers atop a Styrofoam lift, so I would be able to tuck the fondant under the cake and foamcore board under it for a clean bottom look. Here is one tier after it was covered. 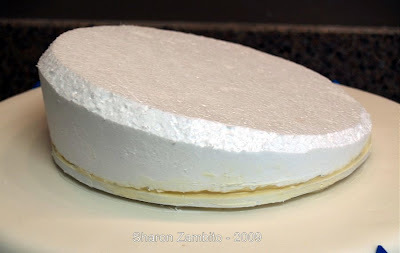 I attached a piece of thin foamcore to the bottom of each styro wedge with white chocolate. This would prevent the supports from going into the styro under the weight of the cakes. I doweled the bottom cake as usual under the wedge support. I used melted chocolate to attach the wedge to the lower tier, and more melted chocolate on top of the wedge, then placed the middle tier in place and held it there until the chocolate firmed up. Then I drove 2 wooden dowels down through both tiers. I repeated the same process to apply the top tier. I wanted the top tier to have more of a tilt to the opposite side, but I miscalculated my slant, so it basically came out straight. Oh well, live and learn. (Dagnabbit!) After the top tier was in place, I drove one large wooden dowel down the middle of all 3 tiers. That cake was very stable and did not budge. Cutting and serving it proved to be a little bit messy, as the melted chocolate between the tiers did tear off some of the fondant when I disassembled it. But I guess that is the price you have to pay to get this look and have it be super stable. I guess you could try to do it without the melted chocolate, but I felt better having it there as glue. 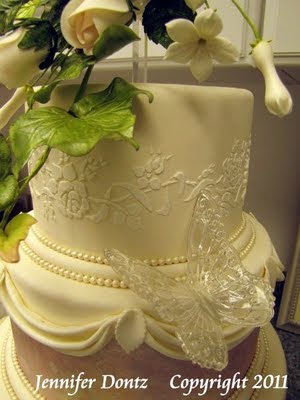 I cut apart all the purchased flower sprays and arranged them on the cake, using royal icing as glue where needed. 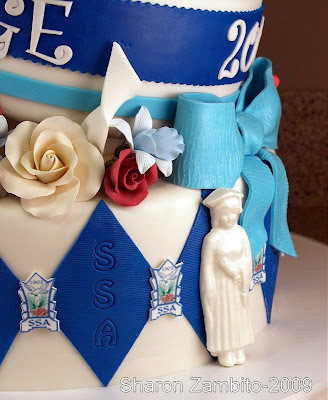 The fondant dove is the school mascot. I used the school logo clip art that I got off their website. I made little icons with edible icing sheets backed with white fondant, to put between the diamonds. 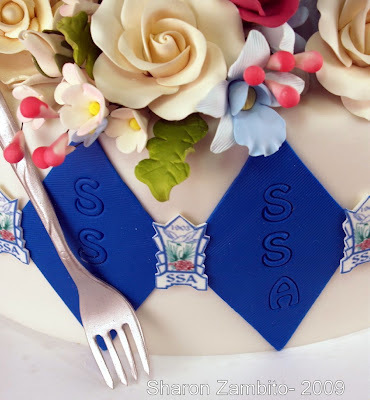 The school initials, SSA, were impressed into the diamonds using the JEM alphabet cutter set. 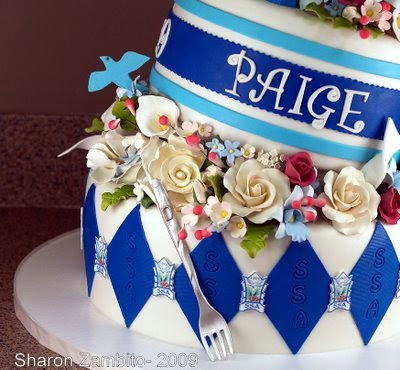 Paige just loved her cake and thanked me over and over and over. Everyone at the party went nuts over it; it was very good for my ego, LOL! I have 4 more nieces coming up behind her, graduating from the same school, so I better start thinking of more design ideas soon! Oy vay. I'll think about that later. This tutorial was used with the expressed permission of Sharon Zambito. This tutorial may not be reproduced without written permission by the author. One of my favorite tasks is to make birthday cakes for my great-nephews. At our family Christmas gathering, my 6 year (soon to be 7 year old.) nephew, Ryan, approached me. "I know what I want for my birthday cake" he said shyly. "Oh yeah? What would you like?" I asked innocently.
" A Bakugan" he gushed excitedly. With the look of unbridled excitement, he gushed again." A Bakugan!!" He was met with a rather blank stare. "Okay. Can you say that slowly? I am not quite understanding what you are saying." Realizing that he was either dealing with a person who was hard of hearing or somewhat dense, he repeated it again ...veeerrrrryyyy slooooooowly. "Hmmm. I have no idea what that is." I said. and other things that made my brain explode into a thousand shattered pieces. It was at that time that his mother came to the rescue. "It is just a ball, Aunt Jacque," she said dryly , " just a simple ball cake." I looked at Ryan. He looked a bit disappointed. "Yeah. 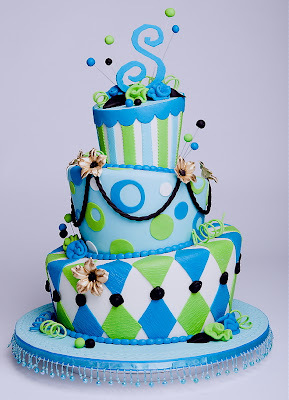 Just a ball cake." he agreed dejectedly and quietly walked away. I could tell by his reaction that this must be no simple ball cake and decided I had better learn more about this Bakugan phenomena! Realizing in short order that this was NO ordinary ball, I had to come up with a rather awesome Vestroia Hyper-Pyrus Dragonoid!! I have to confess it was a battle to the end with the dragon! But the final result was a birthday party of little boys huddled around the cake with whispered exclaims of awe. Between you and me...that made it well worth the struggle! Here is the process I used; and hope it can save you a few scars in battling your own sugar dragon. 2.Moisten body with gumglue and cover body with white gumpaste. 3. Roll out red gumpaste very thinly and cut out wings using the pattern above..
Lay over an empty wax paper roll ( or flower former ) to give curve to the wings. 4.When body is dry, using golden brown gumpaste, cover the underbody of the dragon from the tail to the head. Cover the upper legs and all of the arms. 5.Cut strips of white and overlay in a honeycomb pattern over the golden brown under body. 6.Then make white spikes and place on top of the upper body, securing with gumglue. 7. Form legs and feet using red gumpaste. Remember to leave wire extending from the feet so bamboo skewers can be taped to them. This will secure them into the cake. 8. Make the head from red gumpaste and secure in place with gum glue. 9. Cut little strips of red and begin covering the topside of the dragon, starting at the tail and move up to the head, overlaying the strips like scales. 10.Roll out red gumpaste and cut another set of wings. 11. Finish detailing your dragon by adding claws, teeth, eyes and horned head using white gumpaste. Touch up with gold luster dust mixed with Everclear alchohol. 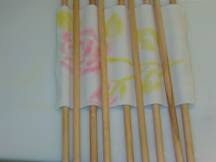 Once completely dry, secure the wires extending from the legs to bamboo skewers using floral tape. 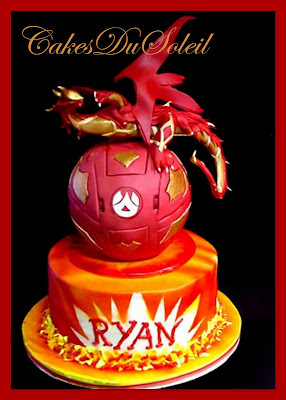 Insert straws into your cake where the dragon's feet will be located. Insert the skewers into the straws on your Bakugan Ball Cake. 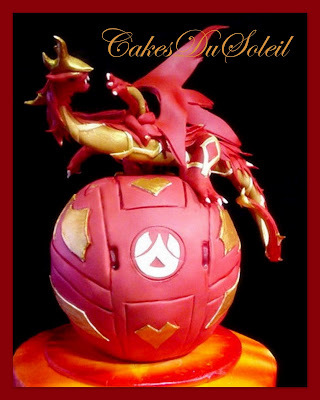 This dragon is rather heavy, so be sure your cake is a dense texture. You can also make your Bakuball from Fondant covered Rice Crispie Treats. This is not an easy task..and it is time consuming. awestruck expression on a seven year old boy's face! And hey...who doesn't like to conquer a dragon once in a while? Tutorial and Photography by Jacque Benson 2010.all rights reserved. 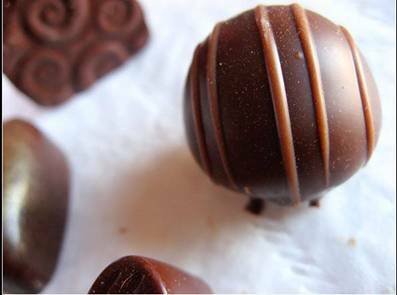 Stay Calm and Keep Baking! Subscribe to this blog...It's FREE! 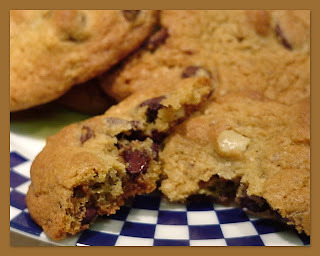 I was instantly in love when Bobbie Noto shared this cookie with SugarTeachers! She is an amazing talent. 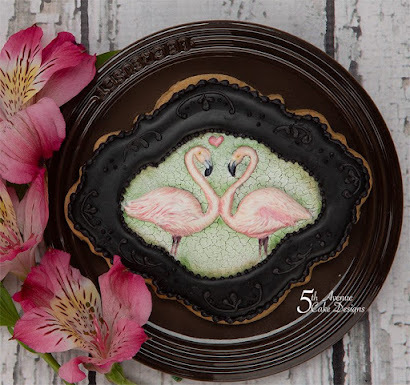 For instructions on how to create this adorable cookie, click on the photo and don't forget to subscribe to Bobbie's website! How beautiful! A great tutorial shared byToni Brancatisano. Click on photo to see the tutorial! 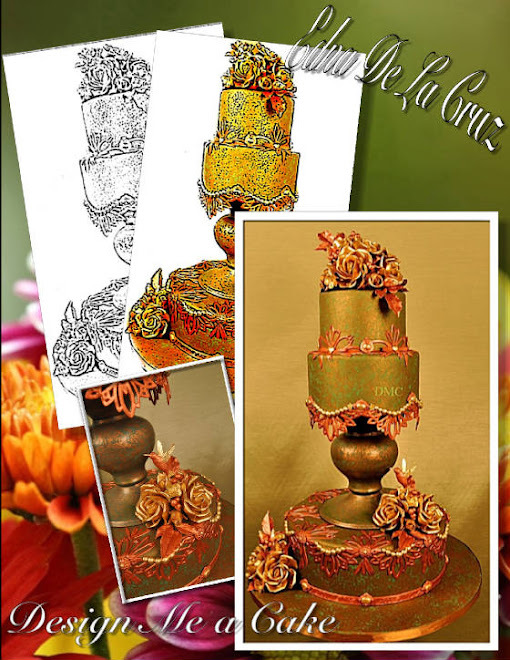 Click on link for Edna De La Cruz's dee-lish cake recipe. Click here to visit Cake Fu! Have you enjoyed Bobbie Noto's brilliant cookie videos? 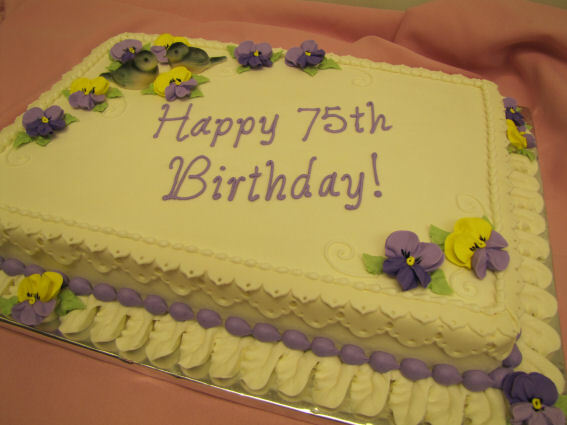 Click on the banner to go to Bobbie's website *5th Avenue Cakes* to find a treasure trove of videos! 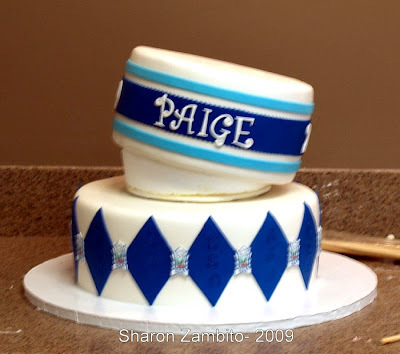 For Online Classes by Sharon Zambito and specialty cake decorating tools, visit SugarEdProductions Website! Just Click on the photo! 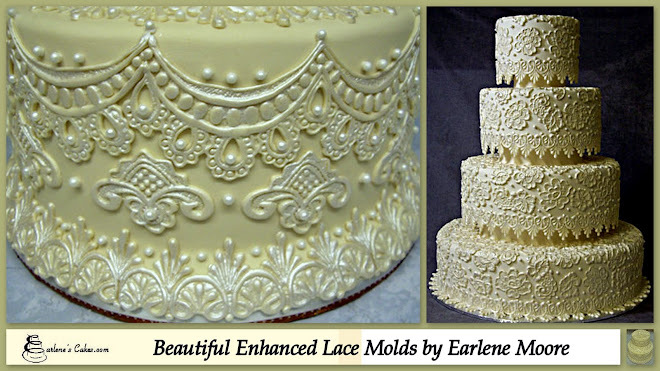 Check out Earlene Moore's fabulous enhanced lace molds! Click on the banner above to visit Earlene's online store! 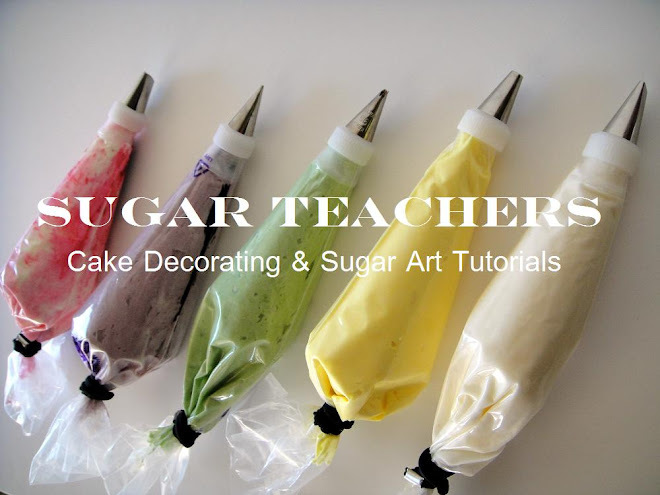 To find great sugar craft tools and DVDs, visit Jennifer Dontz Website, click on the banner! Design Me A Cake . Visit Edna De la Cruz Website for excellent DVD Tutorials and Specialty items! Click on the photo. Blog Roll Center ~ Please Vote!!! Blog Background by "Hot Bliggety Blog"
Thank you to all our visitors!